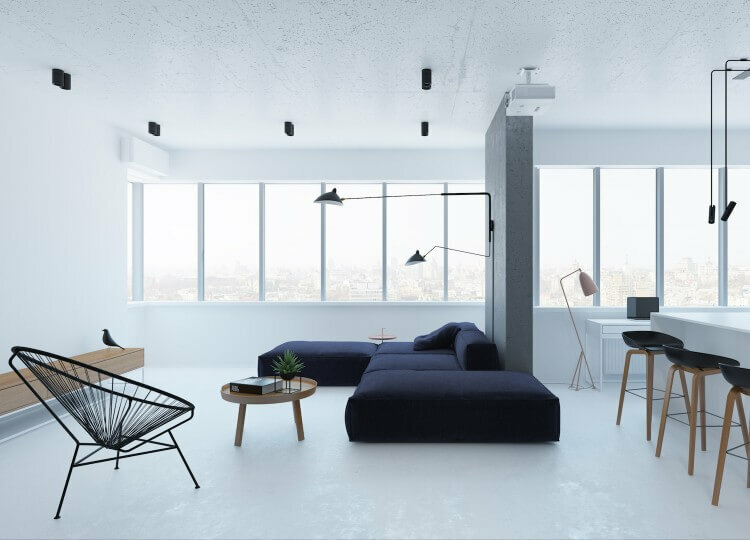 Minimalism is a pretty heavily used term in contemporary architecture – we’ll admit, we’ve used it once or twice in the past. As our world gets more and more cluttered with things, the process of simplification is more necessary, more impactful than ever. 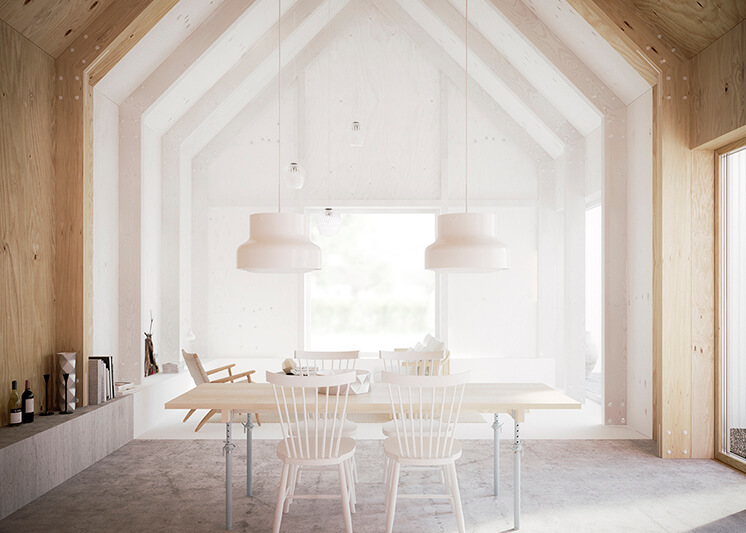 But the beauty of minimalism isn’t just in reducing, it’s in the choice of design elements that reflect simplicity. 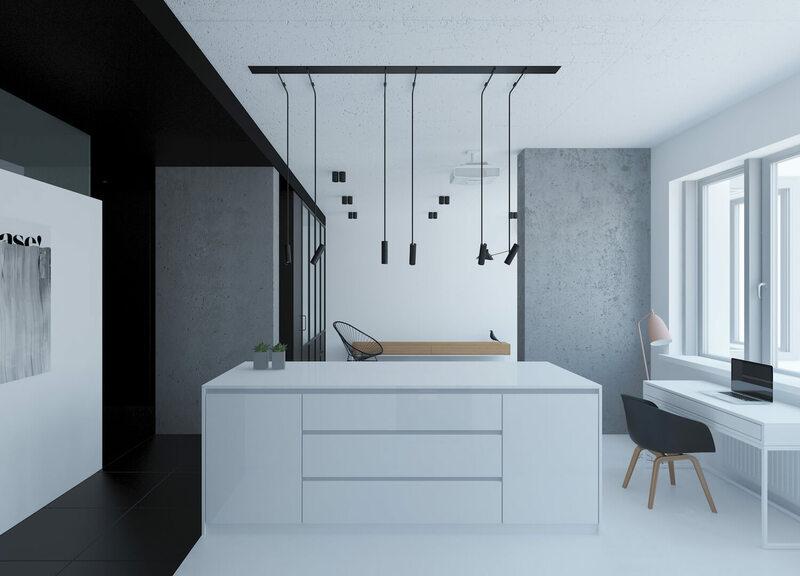 Basic forms, geometric shapes and a clear sense of structure and order – these characteristics speak louder than a limited amount of furnishings. 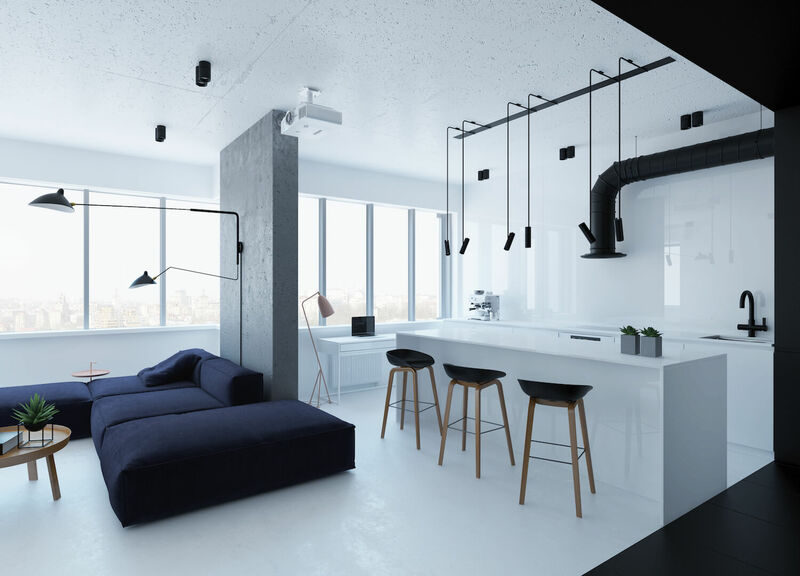 These design elements define this remarkable apartment from Ukraine architect Emil Dervish. 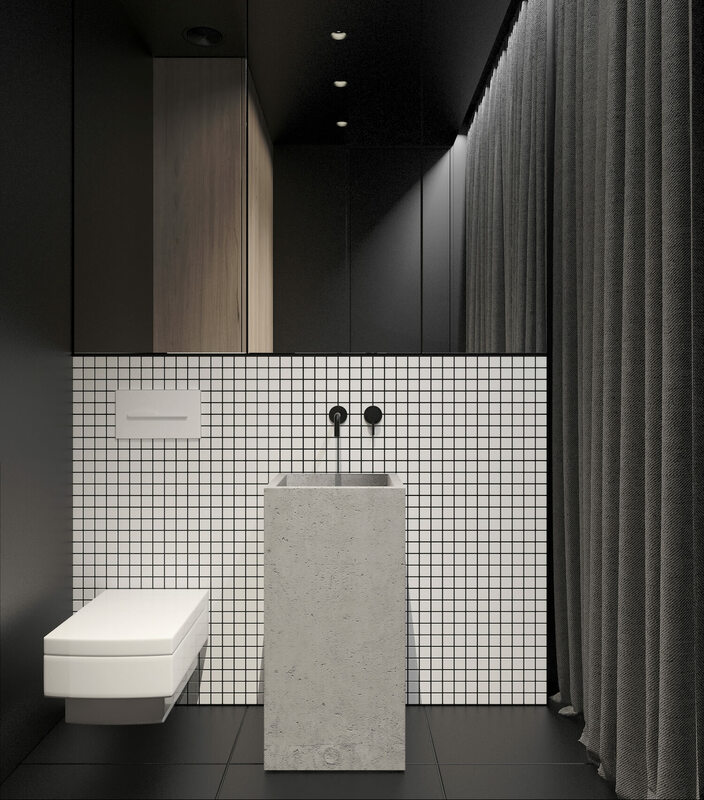 Working with just 64 square metres, Dervish’s design is unambiguously minimalist, using geometric shapes for both aesthetic and layout outcomes. The open plan ‘heart’ of the house combines living, kitchen and study areas, with a bedroom and bathroom quarter tucked to the side. 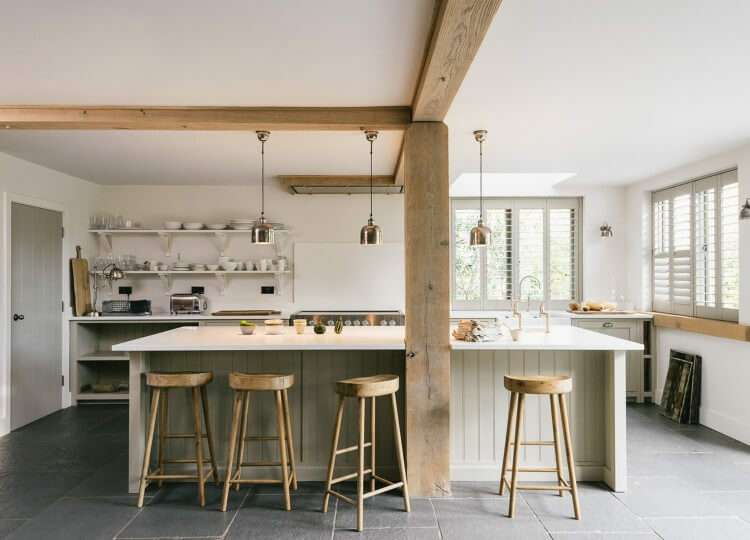 Eschewing the IKEA trend of storage packed in every nook, there’s no hidden furniture or foldout tables, just crucial, cross-functional pieces, carefully positioned to maximise space. 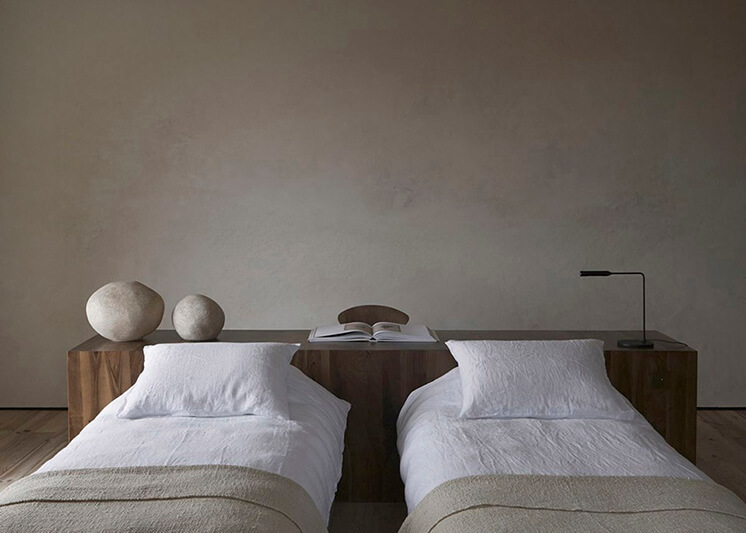 The movement of natural light is another hallmark of the minimalist movement, here cleverly maximised for the small space by Dervish in his use of a lighting project positioned to give an echo-like repetition of the ceiling lamps. 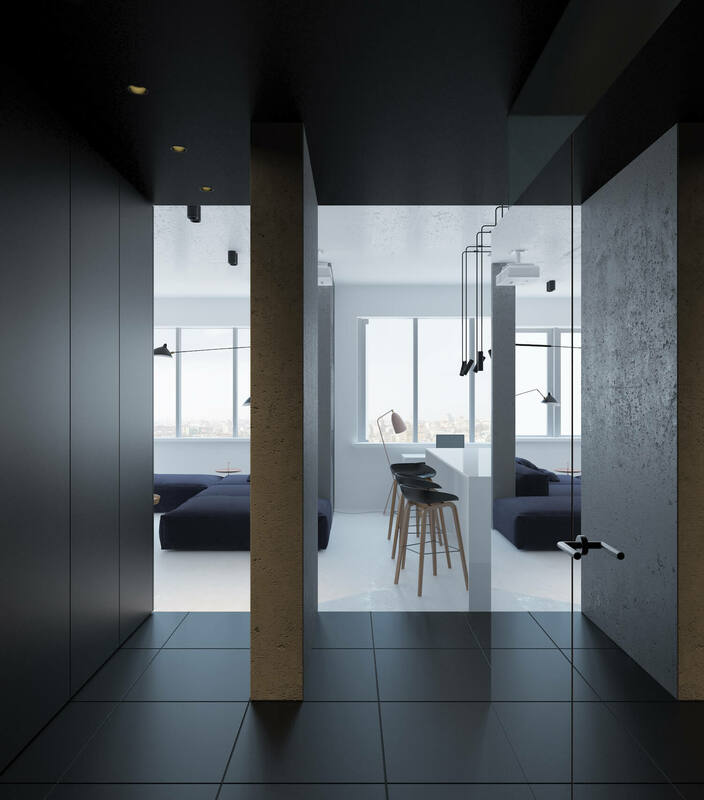 It results in a visual trick that embellishes and extends the existing light throughout the apartment. 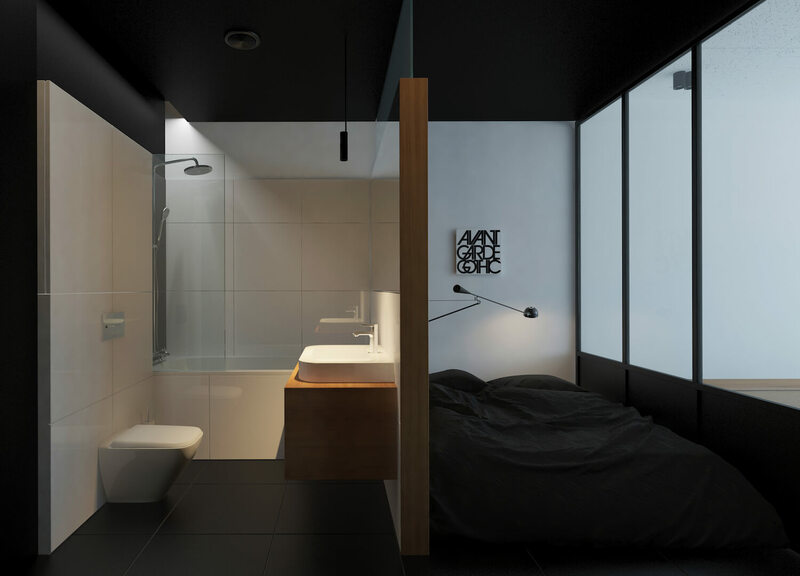 The steel partition separating the bedroom nook from the central living area is another smart solution, opening up the bedroom to the abundant natural light while maintaining privacy and space between rooms. 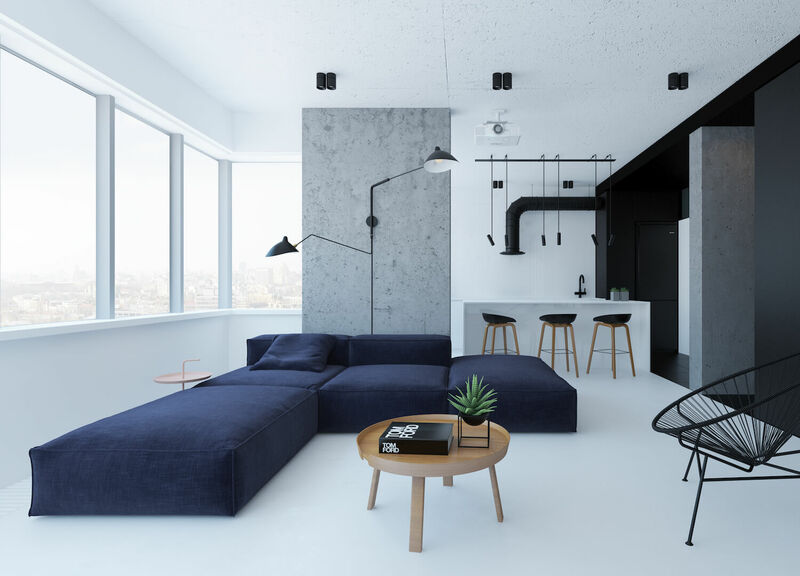 Dervish builds a palette of greys, whites and navy blue with materials such as concrete, polished stone and steel to create an ambient aesthetic. Occasional splashes of pale pink and a couple of punchy artworks add just enough personality without compromising the design’s emphasis on light and shape. In exercising restraint across form, materiality and aesthetic, Dervish has smart solutions for all the limitations of a smaller space. 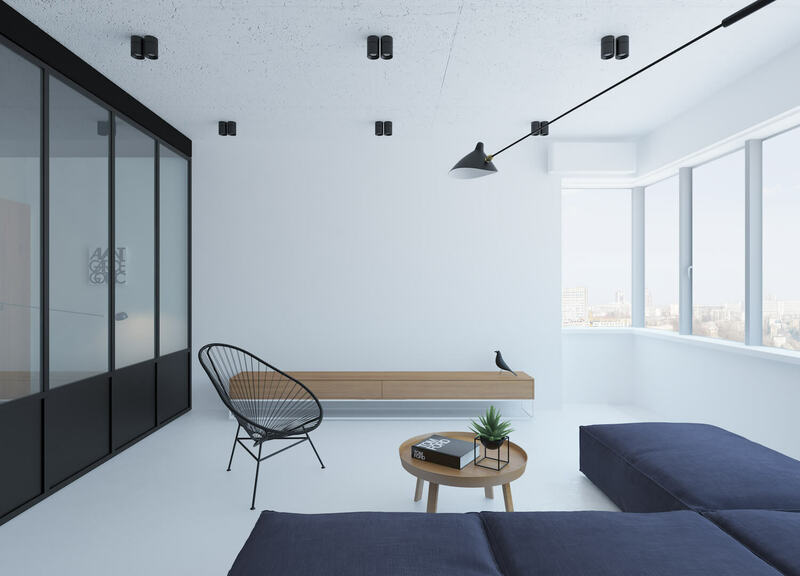 With it’s stylish aesthetic and calm ambiance, this space feels far bigger than its square metre count. 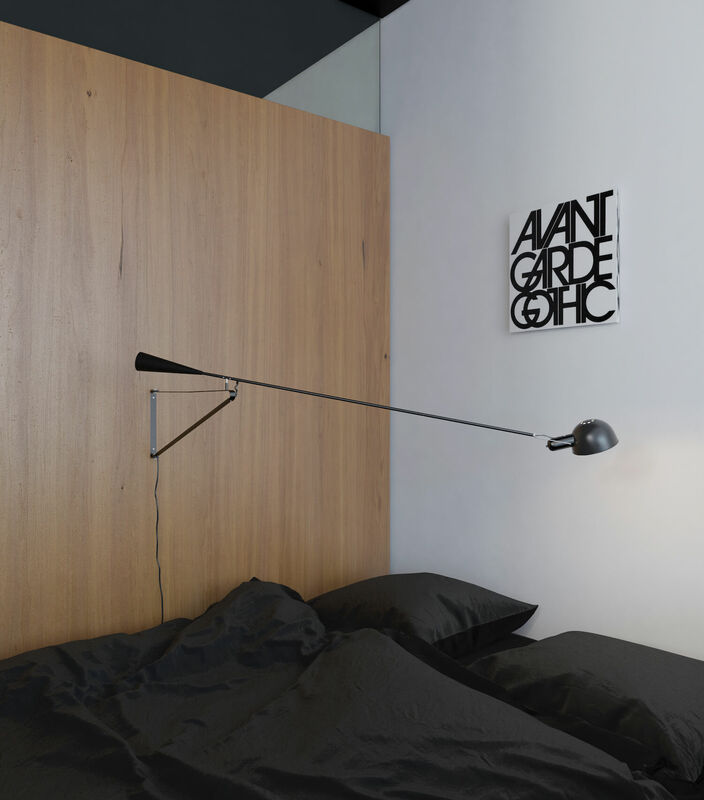 Steel plays a key role in the materiality, from the bedroom window frames and partition, to ceiling and wall lighting (we always love to see a Serge Mouille piece in prime position!) 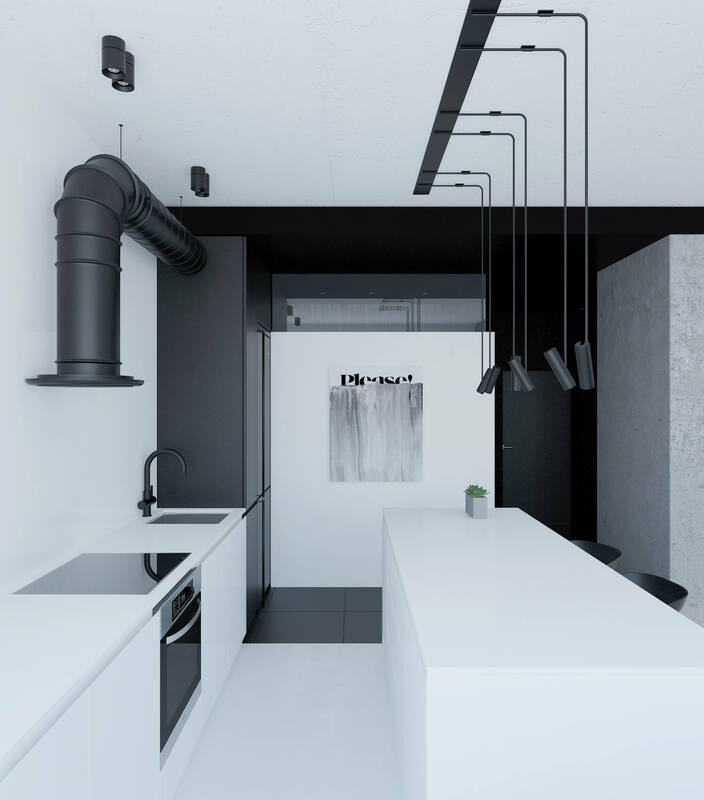 to the striking kitchen exhaust and tapware. 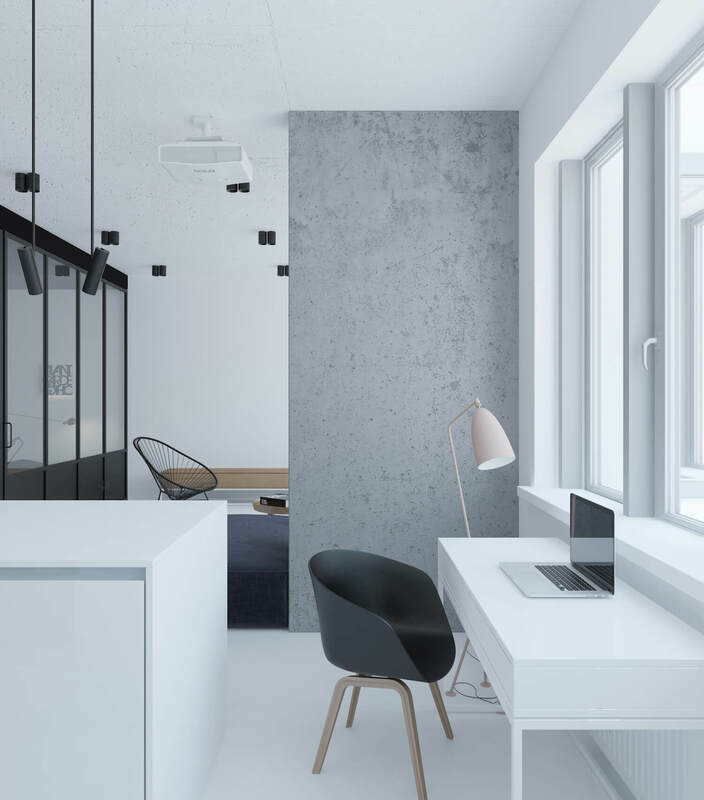 Concrete pillars are used as subtle partitions throughout the structure, adding material contrast to the tiles and white walls and separating open plan spaces without compromising natural light.